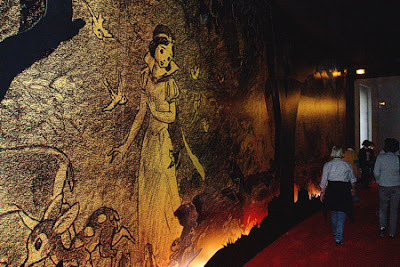 The Blackwing Diaries: Disney in Paris-a post about a post; or Who's going to make the reservations for Montreal? Disney in Paris-a post about a post; or Who's going to make the reservations for Montreal? Il était une fois, Walt Disney (Once Upon A Time…Walt Disney). The terrific report is via a blogger that's new to me, Animated Views' Ben Simon. As Barrier points out, though the Paris exhibit is soon to close, the whole thing will move in March to Montreal. Who's with me? Road trip! I got back from Paris yesterday and the exhibition really is as good as everyone has made it out to be. If you get a chance to see it in Montreal, do go! It's absolutely incredible and I guarantee that you won't be disappointed! It's an awesome show- you definitely don't want to miss it! I went to the exhibition twice in the three months I was living in Paris just to see those Evynd Earle paintings in person again... everything else was just frosting on the cake. Montreal will be lovely in the spring... maybe we can meet you there in May?? How are you? It's been a while! I'm probably going to go in April, as soon as school is done with, and before internship starts. Hope all is well, give me a holler via the ol' blog!